Introducing the first neighborhood concept - Central Park is a revolutionary public space combining nature with nautical. 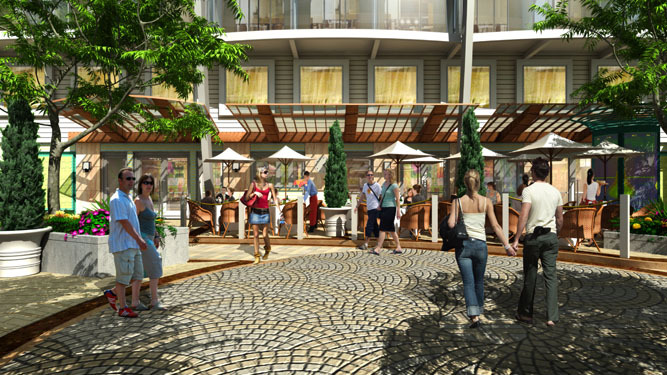 Elegant and lively, Central Park’s piazza is the ship’s town square, which evolves from a tranquil and peaceful atmosphere during the day to a gathering space for dining, entertainment, and street performances in the evening. 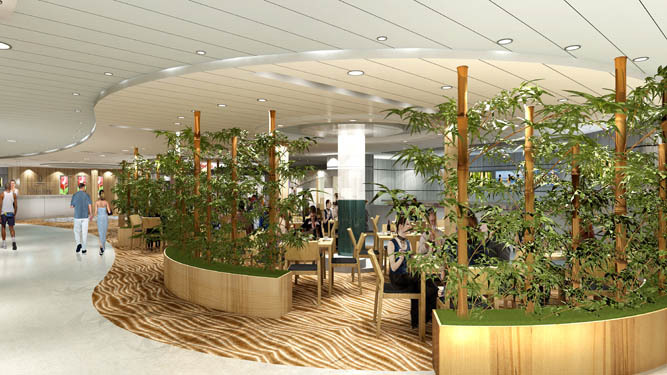 Central Park features several alfresco dining options and more than 300 staterooms, which rise six decks to overlook the Park. Quiet reading corners, specimen gardens, and other hidden surprises await guests among the winding paths. Bringing the outdoors in, Central Park offers guests a tranquil outdoor space, open to the sky, like never seen before. 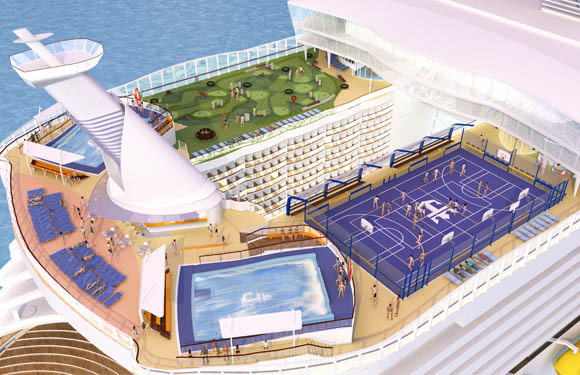 The Royal Promenade neighborhood - the most expansive promenade at sea - continues to be the heart of the ship. Except now, it’s better than ever. 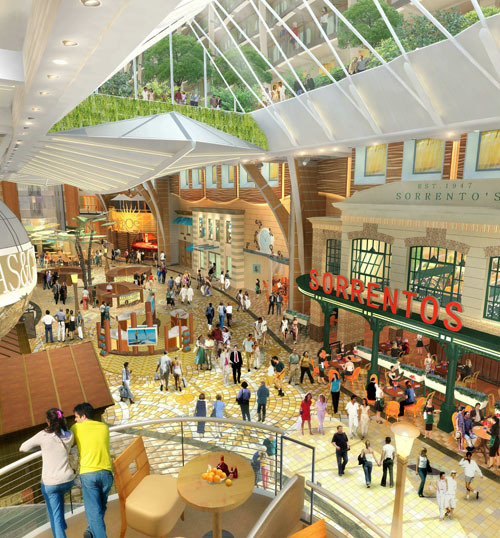 For the first time, the Royal Promenade will have a mezzanine level that overlooks the space below and adds to the excitement of the Promenade. It features Rising Tide; a levitating bar that ascends and descends over three decks, and enough shops and restaurants to entertain even the most traveled of travelers. By morning, enjoy a relaxed atmosphere over coffee, and people watch. The ambiance becomes more energetic and vibrant in the afternoon with shopping, lunch, or drinks in the pub. In the evening, the energy rises with parades, nightlife, and entertainment for everyone. It’s a destination unto itself. A unique focal point of the Royal Promenade is the Promenade Bridge, an impressive world globe, sculptured in shining metal. Prominently displayed above the Globe and Atlas Pub, the globe unravels to reveal an awe-inspiring platform suspended 10 feet high during the Promenade's entertainment festivities. Dedicated to family fun and nostalgia, the new groundbreaking Boardwalk neighborhood is a slice of old-world charm with a modern twist. Introducing the one-of-a-kind AquaTheater and first ever Carousel at Sea. Boardwalk offers enough games, amusement and attractions to keep everyone entertained. Warm sunrays and flying acrobats - it all takes place center stage at the AquaTheater. Daytime, guests can unwind or socialize poolside, go for a dip, or take in the rays while relaxing on the sundeck. As the sun sets, loungers become theater seating. Guests trade their sunblock for evening cocktails, and water acrobats mesmerize audiences with high-diving aerial performances. Theatergoers are dazzled by the spectacular water show, set against the backdrop of the ocean and horizon, under a star lit sky. Six decks of balconies that overlook the theater or Boardwalk offer private views of the show. The Boardwalk offers enough games, amusement and attractions to keep everyone entertained. Surrounded by casual restaurants, including Johnny Rockets® and the Seafood Shack, a coffee and donut shop, bars, candy shop and more, Boardwalk is the place to be for the entire family. 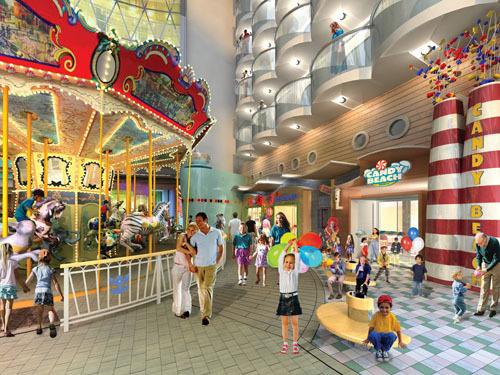 Kids and teens can shop for the latest trends while everyone enjoys a spin on the Carousel. Boardwalk is the place for kids and kids at heart. Welcome to the Youth Zone, home to our award-winning Adventure Ocean youth program, with even more space dedicated to youth activities than ever before. From vibrant teen areas to fun learning environments for our smaller guests, it’s easy to make new friends in this neighborhood—and enjoy non-stop action day and night! Here’s where kids can be kids and parents can be worry-free. Activities are in dedicated spaces for age-appropriate groups, with professional and caring staff to engage curios young minds. The Youth Zone takes family vacationing to a whole new level. 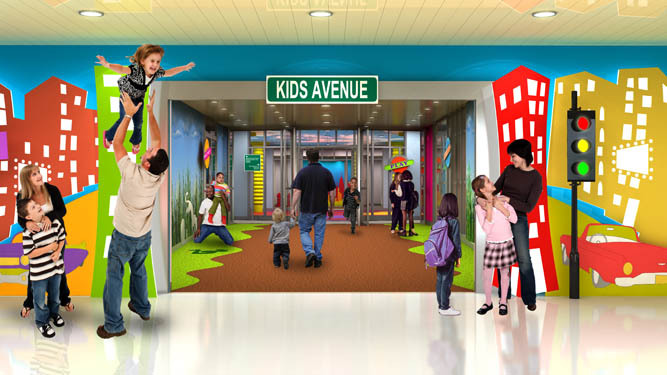 Kids ages 3 to 11 will love the Adventure Science Lab, the Imagination Art Studio and the new Adventure Ocean Children’s Theater. And teens will enjoy lots of hangout areas just for them. Guaranteed to be fun filled, the youth zone is the coolest youth space on sea or land! A place to soothe the mind, body and soul, this state-of-the-art setting designed for the healthy lifestyle, combines the most advanced spa and anti-aging therapies, the latest fitness equipment and healthy dining options. Enjoy the benefits of a relaxing massage or share the experience in one of our many couples massage suites. Restore your body in our Thermal Suite or rejuvenate with one of our many pampering Spa treatments. If you’re looking to energize your body, then head to our fitness center. Try the latest equipment or one of several classes, including spinning, Pilates, yoga and our new Kinesis™class: a full-body, no-impact workout. Hungry? Then stop by the new Vitality Café where you’ll find healthy snacks, juices and smoothies, plus nutritious entrées. The Vitality at Sea Spa and Fitness Neighborhood is perfect place to strengthen your body, soothe your mind, and renew your spirit. More options than you can imagine! A fun filled zone for all ages – it takes up an entire deck with multiple pools, rock-climbing walls, miniature golf, ping pong, two FlowRiders® and a basketball court. All this, plus amazing views of Boardwalk and Central Park below. 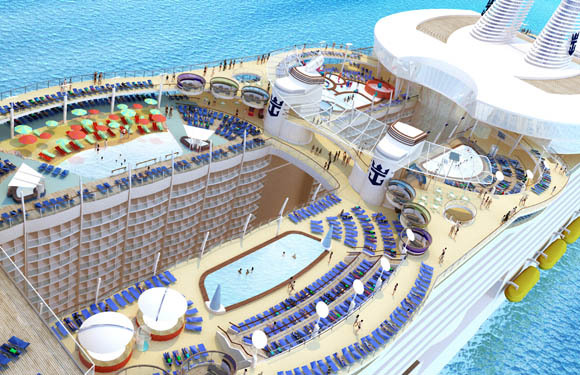 Choose from four pools; theH2OZone,where kids can enjoy a giant octopus with its water-spraying tentacles and a separate wading pool for infants and toddlers; the sports pool, dedicated for laps and water sports or the new beach pool, with a sloped entry that simulates wading into the ocean. Lounge by the traditional pool, now surrounded by private cabanas and more sun loungers than any other ship afloat. When you’ve worked up a thirst, stop by one of four bars or retreat to cool off in our grandest Solarium yet. Surrounded by glass and standing two decks high, this is the perfect place for adults to relax. The new Solarium Bistro offers sit-down dining areas with healthy entrées, and at night it transforms into a unique specialty restaurant. And don’t miss the ultimate, spine-tingling rush – riding on the Zip Line! There’s nothing like zooming over the Boardwalk, a mere nine decks below. 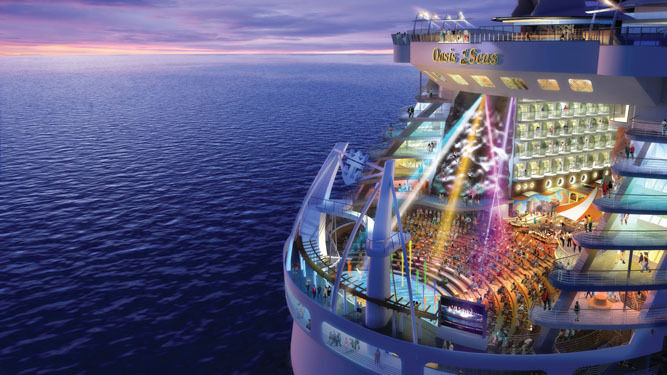 Experience Oasis of the seas! Urban living has made its way onboard with multilevel lofts featuring spacious accommodations which can be combined to offer up to 2,000 square feet of living space. 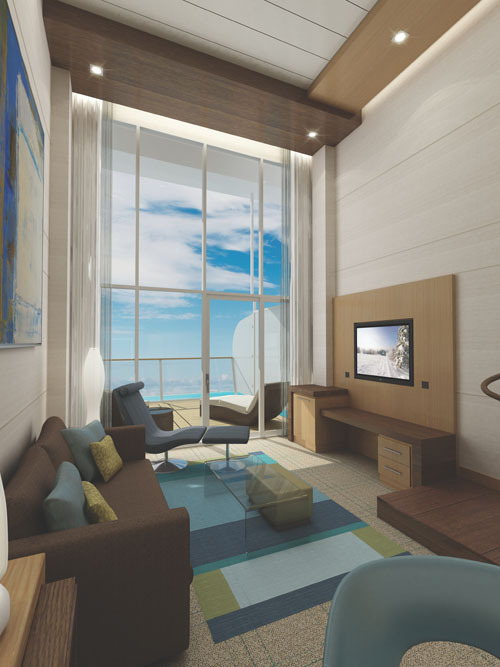 The new suites redefine cruising accommodations with their spacious living areas and double height ceilings. The Lofts boast an open, contemporary design with vibrant, ocean-inspired colors in a sophisticated setting. Floor-to-ceiling windows provide breathtaking views while letting in natural light. Sea breezes caress guests on spacious balconies that offer a retreat and spot to lounge. Guests are treated to a private spa-like experience in their bathrooms, which are outfitted with rain shower heads, natural stone and glass tile accents. You’ll feel pampered in your own private sanctuary at sea. Italicized = new classes of accommodations.